The state of Illinois is working hard to clean up its reputation as a teeming cesspool of corrupt politicians and dumpy quarterbacks with one-syllable names starting with the letter R.
On the same day that insane, Lego-haired former Illinois Gov. Rod Blagojevich was handed a 19-count indictment on charges he engaged in a “wide-ranging scheme to deprive the people of Illinois of honest government,” the Chicago Bears announced their acquisition of Broncos quarterback Jay Cutler amid charges they engaged in a wide-ranging scheme to deprive the people of Illinois of a winning football team. Unfortunately, Mr. 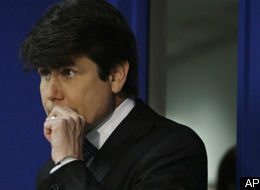 Hot Rod Blagojevich was not in town to hear the news of either the Bears’ blockbuster trade or his imminent incarceration for all the bleeping golden things he did while running the governor’s office like some cheap Al Capone knockoff with Helen Keller as a hair stylist. He is with his lovely wife Patti and two daughters on a much-needed vacation to Walt Disney World. Sure, the kids love it. But for some reason, Rod’s always felt right at home in the Magic Kingdom. There’s just something about Mickey and Minny that he can really relate to. Hey, Who You Callin’ A Rat?